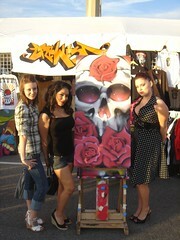 Once again we had a booth for the Dia de los Muertos themed festival on the 6th street bridge. It was a great time and tons of people came out to check out the bands, music, art, and culture. Thanks to all the great artists and friends who supported and dropped by our booth: Vyal, Asylm, Werc, DMN, Sticky Rick, Mezklah, Fletcher (Pennywise), Harry Perry, and you can't forget all the hot East Los chicks!